What went wrong in Australia in 1970? After invoking the timestamp constructor of Date objects and console logging the timezone offset in minutes, we can clearly see a daylight saving inflection point. It is a bug we have to live with. Not a crucial one as I have never seen an application that would require you to use a date object before 1970. While this bug is funny, using the Date object often comes with unnecessary complications. If you know why new Date("2") is February 1st, 2001, then feel free to continue reading this post here. The constructor: Keeping the different ways in mind on how to create a date is quite an adventure in itself. If you want to read the full summary, there are countless references about it. The below examples are executed in a browser console from Germany, Europe. I will use the most logical, sortable and human readable date format in the comments: “yyyy.mm.dd”. Years can be arbitrary. Days start with 1. All other fields are zero based. Most people notice that months are odd because they start with zero. In practice, days pose as the real exception. Months, days and time coordinates overflow in both directions with the side effect of offsetting other coordinates accordingly. For instance, the 0th day of January 2015 is December 31st 2014. The 32nd day of January is the 1st day of February. If you are not familiar with the details, it does not matter. Just stick to proper type conversions and know one way to initialize the date object. Implied timezone: The date object forces the timezone of your system on you. If you think you can get around it by calling methods with UTC in them, think again. You will be able to get and set UTC values without problems. Can your use third party widgets such as charting libraries or date/timepickers? Unlikely. This is what makes the Date object hard to use in some cases. Trying to represent UTC/GMT manually: only do it if your whole system is built based on the UTC getters and setters. Otherwise, your UTC date will be interpreted as local date. Applying the wrong timezone offset: in some cases, you have to supply a fake time to third party libraries by offsetting the Date object belonging to the timestamp with the timezone offset. What’s wrong with the following line of code? The problem is that the above code will work for half a year each year. This code works exactly when the current timezone offset is the same as the timezone offset of the local date represented by the timestamp. I have seen this mistake multiple times. It’s quite a big achievement to locate this bug in legacy code for the first time, but believe me, it becomes disturbing when you see how many times it re-occurred in multiple repositories. A Unix timestamp represents the exact same time instant all over the world. If you freeze the time and enter new Date().getTime() in your console, you will see the exact same timestamp anywhere in the world. The client will be able to interpret and display that timestamp both in local and GMT timezones. In the JSON date string value, Z means UTC. It can be replaced by a timezone designator of form +hh:mm or -hh:mm. JSON.stringify is not a lossless representation of your Date object. As soon as you serialize your date, the outside world will not know your own timezone, as the string represents a UTC date. In addition, parsing an ISO 8601 string results in a string, not a date. While there are workarounds for understanding this format automatically while parsing, in practice, all you need to do is supply the parsed value as the only argument of a new Date object. If you also have to modify the dates on client side without asking the server, you need a timezone database on client side. There is simply no other way in knowing when the daylight saving start and end dates occur. You can reinvent the wheel by implementing your own solution, or you can use excellent and stable client side libraries for handling time properly. According to my knowledge, the best library for this purpose is MomentJs. 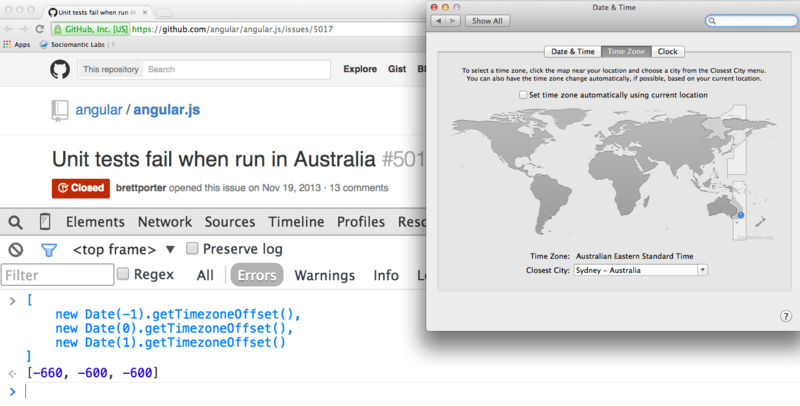 One more piece of advice: update your timezone database at least once per year. Although MomentJs understands ISO 8601 perfectly, you may still want to consider unix timestamps and a timezone string for an exact representation between the client and the server. See http://momentjs.com/timezone/ for more examples. GitHub contains a lot of jQuery widgets. Private repositories contain even more. There is a new charting library in the news almost every week. Many libraries use dates, some of them force your own timezone on you. Suppose that you would like to display data in GMT. This is a reasonable request in case you have offices all around the world and you would like to avoid communication traps. All widgets that work with the Date object force you to fake the date to display the correct UTC coordinates. For instance, the timestamp 954547200000 belongs to April 1st, 2000 midnight. If you pass this timestamp to the Date constructor, you get March 31st in case you are left of the GMT zone. Unless you take care of these anomalies by adding the timezone offset to the timestamp, people in the United States will unhappily conclude that their dates are shifted by one day. In addition, some charting libraries like an old version of jqPlot may duplicate the hour, day or month when daylight saving starts, and skip a month when daylight saving ends in case you apply the timezone offset in the wrong way. The exact opposite happens on the other half of the globe. If you liked this article and think others should read it, please share it on Twitter.